REHOBOTH BEACH, Del. – To make sure the city of Rehoboth Beach continues to be a prime destination for residents, future homeowners, visitors and more. Rehoboth Beach officials are asking for the public’s opinion, ideas, and concerns regarding city the as they put together the 2020 Comprehensive Development Plan. “Any kind of adaptation planning will be necessary to address all of these and look at the impact on our community,” said planning commission vice chair Susan Gay. The plan, that’s updated every 10 years is a way for officials to identify and prioritize specific issues in the area that need to be addressed. And when completed, it serves as the blueprint for the city’s future development. “It includes guidance on public and private land to use, and redevelopment, expenditure of public funds,” said Gay. Currently, Rehoboth Beach’s planning commission has been identifying key areas they’d like the public to comment on including the city’s infrastructure and transportation. “There are a lot of older properties along the block that could use some refreshing in and I would like to see some sort of incentive to make that happen,” said business employee Wesley Paulson. Climate change will also be addressed in this years plan where officials say the beach, boardwalk, and buildings could all be at risk of sustaining major storm damage. 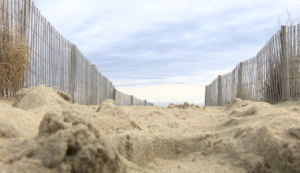 “Keeping in mind that we are in the front of the ocean and how we protect the boardwalk in the dunes in the beach life and also provide recreation for visitors I think is very important,” said Paulson. And with just one more year to finalize the whole plan, city officials say they need the community’s input now more than ever. “Community involvement is critical and defining what we what our future city to look like,” said Gay. The next planning commission meeting for the Comprehensive Development Plan, will be on Friday, March 8th at 3PM. The public is encouraged to attend. City officials also want you to know that if you aren’t able to make those meetings in person they are now providing a live stream for them.